In January, I wrote a blog post attempting to stand up for Atlanta sports fans. While I’m still pleased with how it turned out, there was a glaring flaw in the entire premise: I’m an Atlanta expat living in New York, so I was writing from afar about what it means to be an Atlanta sports fan. Sure, I love my hometown and its sports teams, but my perceptions were based off of what I remember in the early-to-mid-2000s, not recent events. That piece came out the day after the Falcons lost to the Giants in the NFC wild-card game, so it’s no surprise (to me, at least) that I’m sitting at my computer on the morning of judgment day for the Atlanta Hawks, as they prepare to play the Celtics in Boston, down 3-2 in this best-of-seven series, writing about another Atlanta team and its fans. The major difference this time: I’m in Atlanta. And instead of watching the Falcons from a couch in Manhattan, I was in Philips Arena in downtown Atlanta at Game 5, for the spectacle that was a fascinating game and an even more fascinating crowd. I knew if I was ever going to write about my city, known to those beyond the city limits for its legendarily subpar faithful, I needed to see it for myself. In a podcast earlier that week, Grantland editor-in-chief Bill Simmons mentioned Boston fans travel well. As I sat on a plane bound for Atlanta on Tuesday, I couldn’t get that phrase out of my head. I believed it, but I didn’t believe it. Or at least, I didn’t know what “well” meant, to him. Although this is a man who knows his basketball, my inclination was to ignore the warning (or threat). Yes, this was Atlanta and, yes, we were down 3-1, but this was playoff basketball. Large patches of green were to be expected in the arena, but that’s really all I expected — patches. By the time I got to my house, I had about 90 minutes to change, pick up a friend, and get to Philips. During this stretch, I tried to imagine what type of fan I’d be once the game started. I knew it would either go two ways: (1) the loud, obnoxious fan who stands up and screams at every play, while people around me are sitting, semi-wishing I’d shut up so they could enjoy the theater that is a playoff basketball game, or (2) the loud, obnoxious fan who stands up and screams at every play, and doesn’t feel alone in this because everyone else is standing up and being loud and obnoxious. As I daydreamed about these scenarios, I looked through old drawers for some Hawks gear. Nothing. Wanting desperately to represent, I settled on the sweatshirt I brought home, a Braves/Blue Jays 1992 World Series getup. It wasn’t Hawks, but it was Atlanta. I drove across town to pick up my Game 5 accomplice. His attire mirrored mine: an old, tattered T-shirt, complete with images of the Georgia Dome, Georgia Tech, and the familiar Atlanta skyline. Again, no Hawks, but again, seemingly fitting. We were natives, and in this transplant city, there was almost more pride in going to a Hawks game wearing clothes that predate the current Hawks jersey. Or at least that’s what we told ourselves. After truly showing my seven-year absence from living in Atlanta by getting turned around downtown, we make it to the arena about five minutes late. As we picked up the tickets, I looked around at the crowd gathering outside and became ecstatic at the amount of non-green that I saw. Sure, a good amount of it was Hawks gear, but I also saw Braves jerseys, Falcons jerseys, a few pieces of ’96 Olympics clothing, and (most distinguishably) Braves “A” hats everywhere. This was going to be phenomenal. Based on the crowd milling around outside, it seemed as if Philips Arena would actually feel like a hostile environment for the Celtics. I knew we’d come through when it mattered. Once we took our seats, though, those small patches of green that I expected to see began to look more like long, thick sheets of green. I found myself surveying the crowd to see all the Boston fans, and just as I had done a full loop, the Celtics drained a 3. At that moment, every Boston fan launched out of his or her seat, more loud and obnoxious than I’ve ever had the privilege of being, and it became clear that this was a hostile environment — for the Hawks. The Celtics fans had managed to turn this into a 50-50 fan split, a sight so upsetting and embarrassing that I almost regretted making this trip in the first place. How could I ever defend this? While a handful of the 5 million-plus metropolitan Atlanta residents decided to attend what was potentially the last game of the season, seemingly every Boston native turned Atlanta transplant was in the building, proudly as a “not Hawks” fan. This was bad. As the first quarter ended and the second pushed on, there were small groups of people across the arena standing up on every positive Hawks play and booing on every “bad” call, seemingly in an attempt to will this team (and this crowd) to victory. But the men on the floor donning Hawks uniforms weren’t doing much to aid in the process. Missed shots, careless turnovers, and dejected walks to the bench for timeouts did nothing but make it harder for a fan to believe in this team. Neither team was playing extraordinarily well, but the Celtics had found a way to keep a nice five- to eight-point cushion over us, something that didn’t seem to be wavering anytime soon. And then, with two minutes left before halftime, the Hawks decided to make four straight 3-pointers (Marvin, Marvin, Joe, Teague). The third 3, which tied the game, marked the first time all night that the towels placed on our chairs were actually used properly. It finally looked like one of those professional basketball games you see on television. And when Teague made his, giving the Hawks a three-point lead, their first lead since the score was 3-2, it was as if we had just won the championship. We Hawks fans have no poker face. Not even close. We aren’t used to nice things, so there was no point in staying reserved and pretending like this was par for the course. As a Boston fan, I would have looked at us and thought, Look at these fools, while quietly just whispering “17 titles” to myself on loop, but we didn’t care. This was our moment. Up three points. Before halftime. It was truly a great time to be a Hawks fan. And then Rajon Rondo hit a 3 at the buzzer to tie the game going into the half. I would say the air was sucked out of the building, but that’d be false, seeing as that half the building was made up of Boston fans. It was electric, but just not the kind up electricity we wanted. All the Game 6 talk that somehow went from my heart to my brain to my mouth to the ears of Boston just 10 seconds earlier were now coming back to haunt me. I sat, with my rally towel over my face, for such a long period of time that I hadn’t noticed that my friend had stormed off in a fit of rage up the stairs. As the Hawks held on to a lead through the third quarter and the beginning of the fourth, Hawks fans behaved with restrained excitement. When something would go well, joy would fill the building, but when something bad happened, it was almost as if the collective thought was, Well, it was fun while it lasted. When’s the next Braves game? After trading buckets and the lead, an Al Horford jumper and a Marvin Williams dunk not only put the Hawks up by three but forced a Celtics timeout. 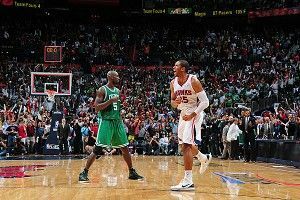 And it was at this point, with the Celtics needing to regroup, with 6:22 left in the game, that the Hawks fans in Philips Arena stood up and stayed on their feet. This might not seem like big deal for a city known for its professional sporting support, but the fact that the entire Hawks crowd stood up was shocking to witness. The opposite feeling of realizing the Celtics occupied half of Philips Arena in the first period was now running through my body. This was great. The way the game ended (with a Hawks win) and the reaction to the way the Hawks handled themselves in this high-pressure situation (Hawks have the ball and proceed to inbound it to Rondo, but thankfully find a way to hold on) really explains everything. When the buzzer sounded and the Hawks and their crowd came to terms with the reality that we dodged a giant bullet, there was excitement as streamers came down, but also a feeling from the crowd that even when the Hawks win, they stink it up. No one wants to be proud of winning a game like that, and the walk out of the stadium was one of half joy and half embarrassment. As we approached the door to leave Philips Arena, though, a very fitting chant took place. It wasn’t “Go Hawks, Go” or “WE. LOVE. MARVIN.” Quite predictably, it was “A-T-L, A-T-L, A-T-L.” That’s the moment that I realized what it meant to be an Atlanta fan. There had been hints all day that would have suggested this (our clothing as the initial example), but the chant really made it explicitly clear. The fandom and the pride and the loyalty was less in the professional sports teams, and more in the city. The pride is in those three letters, less in the athletes and the teams that play here. Is this a good thing for our sports reputation? I don’t think so. But for city pride, it’s weirdly beautiful. In some ways, a city filled with people who won’t hesitate to tell you where they’re from (if you know people, especially twenty- or thirtysomethings from Atlanta, you’re probably familiar with this description) it’s almost as if we expend so much of our reserves on the city, there’s almost little investment left to spread across the pro teams. Would a championship in Atlanta change that? Potentially, but planning on that in the near future is something I’d rather not lose sleep over. So are we the worst sports fans in America? On the surface, for a city of our size and influence and long history with professional athletics, I’d have to say yes. We’ve got a great number of things working against us (a history of losing coupled with a tendency to absorb transplants who stay true to their hometown teams), but for some reason, that’s OK. Maybe this is me approaching it as a native, but a great deal of my pride lies in the fact that everyone wants to move to my city, fan or enemy. Yes, I’m a Hawks fan and took pride in losing my voice by the end of Game 5, but my real pride comes from getting to be from Atlanta. You can’t win ’em all, and if it means I’m a part of the worst fan base in professional sports, then so be it. We’re not expected to win tonight in Boston, but I think we will. And then I think we’ll win Game 7, because, why not? But we could easily lose in Boston tonight by 35, because, why not? This is Atlanta sports. Anything is possible. Can’t wait.